Blurb: In the near future, everyday life is dictated by algorithms, from who gets a bank loan or a job, to what supermarkets sell and which news stories you read. Even policing is run by AIs, who track patterns and predict where crimes are likely to occur. After finishing that book, I’m still not 100% sure exactly what I just read. I mean, it was a thriller, most definitely. Science fiction, absolutely. The tech was advanced, the twists positively mind-blowing–I’m still can’t believe the biggest one–and the pace was quick, even if I felt it took forever to learn the answers I wanted to know (but even then, I’m not quite clear on exactly what happened). I think, if you’re a seasoned reader of thriller or science fiction, you’re going to positively love this book. If you’re more of an occasional dabbler in either genre, like me, then you also might positively love this book. If you’re me, though, you’re just left a little floored, but mostly confused. There is no doubt in my mind this is really a quality novel. It was clever beyond compare, with a plot that was intricate and complex. I think, just for me personally, it was a bit too over my head and it just never really clicked for me, even when everything was revealed and the twist was finally triggered. With wanting to know what was going on the entire time (as every good thriller drives that desire) and then not being able to truly grasp what went on by the end, I’m a little disappointed in that aspect. But I honestly think that’s just your inexperience-reader-in-these-genres talking. Or perhaps it was the fact that I was usually sneaking in reading this book during my dinner breaks at work, so I wasn’t able to focus on it entirely, so I was missing little details or explanations. Or perhaps it was just a novel with a plot that went over my head. That being said, I did enjoy it, even if the payoff at the end wasn’t what I was hoping for. It was a nice change of pace from what I normally read and I’d been curious about what it would be like for a while, after Titan was kind enough to send me a copy. I also read the synopsis of Godfrey’s other series, starting with New Pompeii, and damn if that doesn’t sound intriguing as hell. Godfrey is obviously a good writer, so I wouldn’t mind checking that series out. 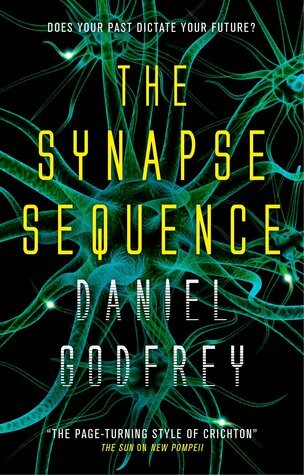 For me, however, The Synapse Sequence was just a little too over my head. But I hope, if the premise interests you, you take a look at it! Because there is a lot of quality to be found there, too, with plenty to puzzle through and a twist that will floor you (even if you’re me and don’t fully understand how that was possible).